Fender’s Parallel Universe guitars have raised a few eyebrows so far - the off-kilter Jazz-Tele and LP-ish Troublemaker Tele to name a couple - but we can’t imagine many guitarists complaining about this beauty: meet the Limited Edition Tele Thinline Super Deluxe. 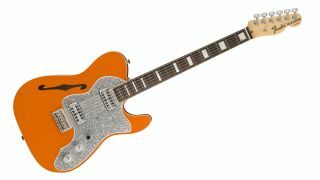 The Super Deluxe takes its cues from classic Tele Thinline and Gretsch designs, with a double white-bound orange lacquer-finished Thinline alder body teamed with a silver sparkle pickguard and dual TV Jones Classic humbuckers - reminiscent of cult favourite, the Cabronita Telecaster Thinline. There’s also a deep C-shaped neck with 9.5”-radius rosewood fingerboard and block inlays, American Professional Tele Deluxe hardtail bridge and Limited Edition neck plate. We’d love to see a production run of this one. 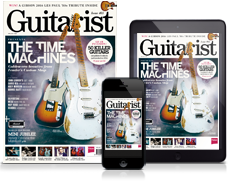 For now, the Tele Thinline Super Deluxe is a limited-edition design, available for $1,999/£1,609. Check out more model mash-ups from the Parallel Universe line, and visit Fender for more info on this one.